So, we have had some interesting news on the Comic Book front which I figure I will bring up here. It seems that Gamestop is thinking of getting into the Comic Book Business and wants to start selling the new issues. This is interesting as Gamestop is owned by Barnes and Noble but they also own Think Geek. In many ways we think this may not really touch the Comic Book trade as so many stores are successful due to the fact that they are known and loved for carrying the variants, older issues, and collectible comics. I think that just missing out on some new issue sales may not hurt them too badly. What do you guys think about this, sound off in our comments below! This week we have two comics from the awesome peeps at Vibranium Comics and Games one which is good and the other which was…well it was there. So, before we start be sure to show our friends at Vibranium some lovin by checking out their facebook through the linked banner above and their website through the banner below. This week let’s get the meh one out of the way. Yeah that’s right, I described it as Meh. 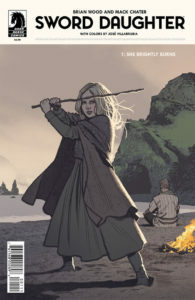 The name of this book is Sword Daughter and it comes to you from Darkhorse Comics. It seems that the basis of this story is that someone kinda vikingish group went rampaging through this viking type village and the main character’s father was knocked out. The main character is a young girl of 12 years old who took care of her comatose father for those 10 years. Yeah they expect us to believe a 2 year old girl took care of her father for 10 years on her own. I know that comics are supposed to be like movies where you suspend your disbelief while reading them, but this stretched mine way too far. So there’s not much else I can say about this one. The daughter speaks in pictures and wants to play with swords while the father doesn’t want to be a father since he doesn’t know the daughter due to being unconscious for 10 years. He also is hunting for those who had attacked them way back when. All in all, there was a small amount of action but nothing that amazing or special. The artwork was also kinda meh. Good characters and talent, but the whole book was very devoid of color…not quite black and white but just a step away on most pages. This made things just monotone and meh throughout when I am used to mostly ore colorful characters. The combination of less than stimulating story with less than stimulating art just didn’t leave me enjoying this one. All in all the comic was just meh. I can’t really recommend it, but I also wouldn’t say to steer clear if you’re into the medieval type of stuff. If you like vikings then this might be right up your alley or if you are looking for some reference pics for your own art work it might serve as a good introduction character study for how to draw the viking class. If you have picked up this one, let us know what you think in the comments below! I haven’t picked up a Dark Horse title in years. I know they really got into doing licensed properties, but they had a good track record for other stuff too. However, based on your review, this sounds awful. How is Dark Horse doing and are they producing any non-licensed books you’d recommend? This book doesn’t sound like it has any sort of hook to grab readers. Would you agree? I thought it was amusing you said the book might be good for people looking for art references. I just use screen grabs from TV and film now for that. My husband actually got me this comic and I have to agree that I had higher hopes for it. Anytime he goes out of town for work he brings me back a random comic he thinks I might enjoy. When he asked, I wanted to tell him it was awful but I didn’t want to sound ungrateful so I said it was good but now I am regretting that. If he shows up with a new comic from this series I will have to lie though my teeth again! I don’t know if it was the progression or the characters but I could hardly finish the thing. I’m one for medieval stuff but how the storyline plays out as you described it, I don’t think it’s something for me. Also how it’s so bland without any colors, definitely not for me. This seems to be like the type of comic that’s hard to find though, I don’t think this is something I can find just anywhere. So maybe people are in on it for collecting or something, would you think so?